Finally, a use for all of those extra kumquats! The kumquat is the kind of fruit that you tend to either love or hate, but even the most ardent avoider of this bittersweet little citrus relative would love it as a tangy glaze. If kumquats are unavailable, it's a great use for other acidic citrus like calamondins or key limes. Below are my three favorite variations, from a two-ingredient version to an exotic spicy ginger kumquat glaze for the more adventurous. Each of the glazes can be used with the bonus 15-minute glazed salmon recipe at the bottom of this post. 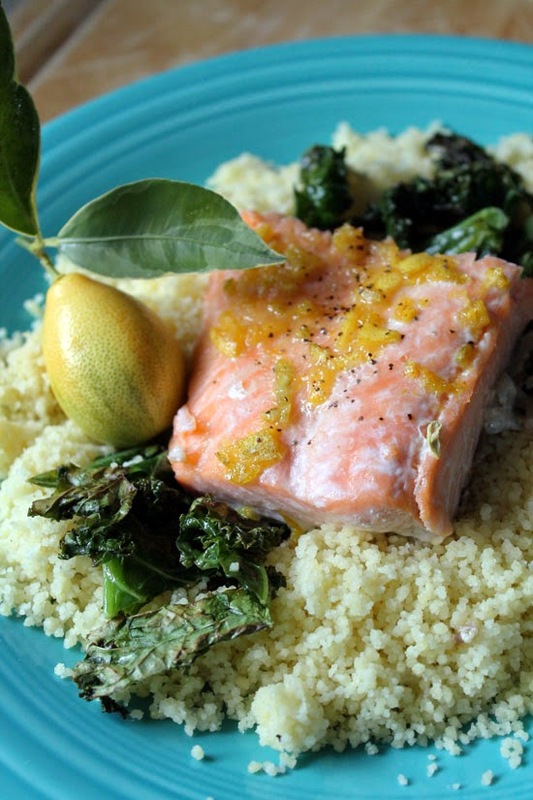 This kumquat glazed salmon with sauteed kale and couscous took about 20 minutes to make. What's a kumquat, you ask? Kumquats are little fruits with really big flavor, and anyone can grow one of these plants in their home or garden. 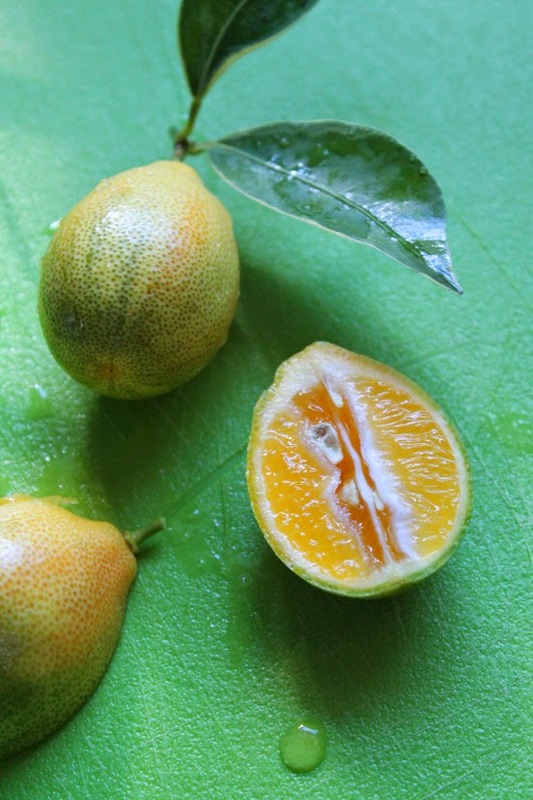 Some of you have only heard of kumquats because they're used to describe the size of a developing embryo in pregnancy guides, but they're also an underutilized fruit that can be eaten rind and all... or used in marmalades, marinades and anywhere oranges, lemons and limes are used. Kumquat plants are easy to grow in pots and bear fruit at an early age, making them ideal as edible houseplants. Here in my zone 8b garden, I grow a small bush in my garden. If finding and growing your own isn't possible, you can often find kumquats in winter and early spring at the grocery store. I came up with these recipes just after realizing that I was actually tired of eating kumquats. They're tasty little fruits to be sure, and varieties like 'Meiwa' are even sweet enough to pop like candy, but my variegated 'Centennial' kumquats are pretty sour... I needed a break. I was making a maple glazed salmon recipe for dinner, but decided to replace the maple syrup with the sugar cane syrup that I helped make at the Outlaw's. Once I deviated from the recipe a bit, I had another thought: "Why not add a squeeze of kumquat juice?" Before I knew it, I was finely chopping the sweet rind and mixing it into the cane syrup with a blend of seasonings. 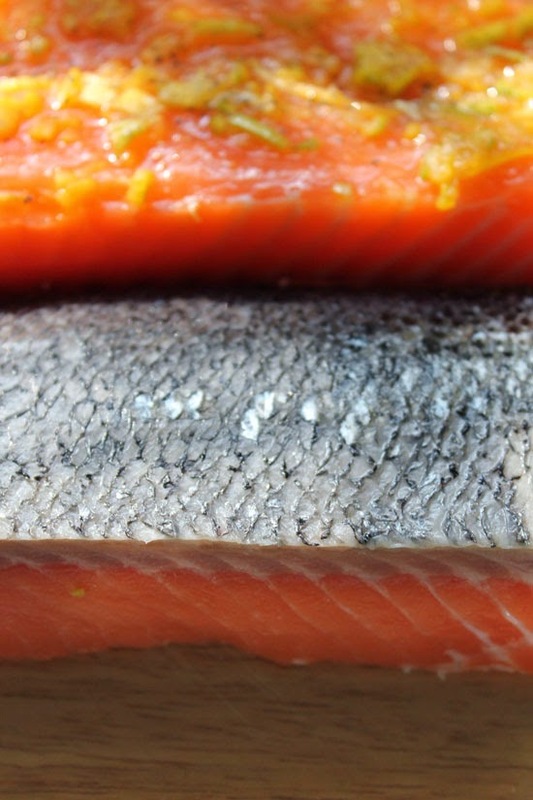 I've made this recipe several times since and no matter what seasonings I use, the kumquat glaze always pairs well with the fishiness of the salmon. You can use honey or maple syrup instead of cane syrup if you'd like, but it's worth looking into buying a bottle of cane syrup for its light and unobtrusive grassy flavor. The appeal of using kumquats is that you can use the whole peel, but if you can't find them at the grocery store or in the garden, you can use a lemon or lime instead. Just use a zester on the peel rather than chopping them whole. Here's the basic kumquat glaze recipe, followed by a few variations. As you can see, there's lots of room for creativity! This fast and simple glaze is surprisingly complex on its own, but you can season it to taste. Pour the 1/4 cup cane syrup into a small bowl. Cut the kumquats into quarters lengthwise, remove loose seeds and squeeze the juice into the bowl. Pull the remaining pulp and seeds out of the kumquat quarters and finely chop the rinds, adding them to the bowl. Stir the syrup, juice and chopped rinds together and refrigerate. Season to taste. This honey mustard glaze with a twist of citrus goes great with chicken or pork. Pour the 1/4 cup honey into a small bowl. Cut the kumquats into quarters lengthwise and squeeze the juice into the bowl, discarding any loose seeds. Pull the remaining pulp and seeds out of the kumquat quarters and finely chop the rinds, adding them to the bowl. Stir the honey, mustard, juice and chopped rinds together and refrigerate. Spicy, tangy, savory and sweet, this variation is a perfect match for Asian recipes using seafood, chicken or pork. Pour the 1/3 cup honey into a small bowl. Cut the kumquats lengthwise and squeeze juice into the bowl, discarding any loose seeds. Pull out and discard the remaining pulp and seeds, and cut the rind finely into narrow slivers. Combine chopped kumquat rinds, garlic, ginger and seasonings into honey, stir and refrigerate until needed. You can use the kumquat glaze in a variety of ways, but this fast and easy fish recipe only takes about 15 minutes to make. Preheat oven to 450 degrees F. Place the 4 cuts of salmon on the baking sheet, skin down, and gently brush them with the glaze. Roast for 8-10 minutes until opaque throughout and tender. 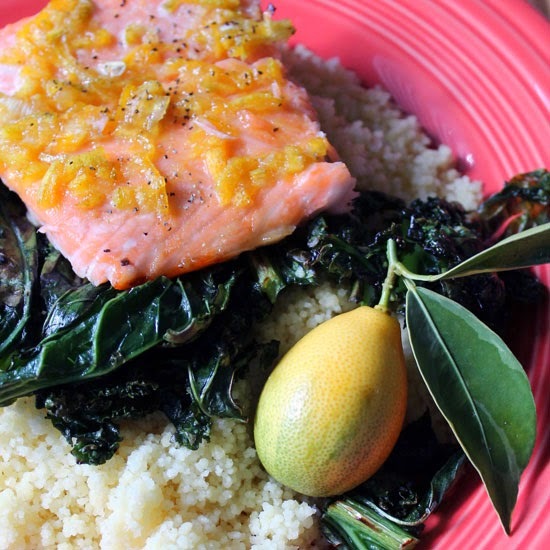 Glazed salmon atop sauteed kale and couscous - you can adapt the sides to the seasonings you use. Have any other bright ideas of how to use kumquats? Please share! These delightfully tangy kumquat fruits might be small, but they're the biggest new flavor in my kitchen..
Great idea for these tiny fruit. I really don't like them but my Mom planted one that is in Dad's backyard. Since he's 91 he's not allowed back there anymore because of the slope but I think I will go up and pick some and use your recipe. Thanks!